An ongoing research project into the detection of illicit drug use has shown that of a sample of bank notes in current circulation in the greater Dublin area - €5, €10, €20 and €50 denominations - 100% of them showed contamination with cocaine. The research was carried out by PhD student, Jonathan Bones, working under the supervision of Professor Brett Paull at Dublin City University's National Centre for Sensor Research (NCSR) which specialises in sensor technology used in medical diagnostics, environmental monitoring and other industrial applications. The research was funded by the Irish Research Council for Science, Engineering and Technology. Using a technique involving chromatography/mass spectrometry, a sample of 45 bank notes were analysed to show the level of contamination by cocaine. The cotton structure of the Euro bank notes adsorbs chemical residues, making it relatively easy to analyse. While all of the notes proved positive for cocaine contamination, three showed the presence of heroin. Contamination can occur whenever direct contact between the note and the drug takes place, either through the common practice of 'snorting' through a rolled-up banknote, as a result of transfer during drug dealing or through the cross-contamination of notes during the counting process in financial institutions. 62% of notes were contaminated with levels of cocaine at concentrations greater than 2 nanograms/note, with 5% of the notes showing levels greater than 100 times higher, indicating suspected direct use of the note in either drug dealing or drug inhalation. 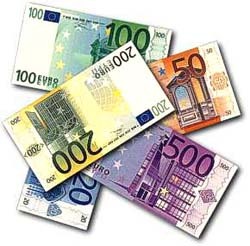 The highest amounts of cocaine residues were found on €20 and €50 bank notes, as compared to €5 and €10. The remainder of the notes which showed only ultra-trace quantities of cocaine was most probably the result of contact with other contaminated notes, which could have occurred within bank counting machines or from other contaminated surfaces. "This is the largest sample of notes ever used in an experiment of this kind in Ireland", Bones said. "A larger number of notes would give a more representative view of cocaine use in our society, but the number used is sufficient from which to draw conclusions. The most recent survey carried out in the US showed 65% of dollar notes were contaminated with cocaine. However, the 100% rate uncovered in this project was surprising. Although not a quantitative measure, the presence of illicit substances on banknotes in general circulation provides an indication of the degree to which substances are being used by the community". "The greatest advantage to using money as the test matrix is that it is readily available, non-invasive, anonymous and relatively safe to work with. Further research would need to be carried out to provide a more accurate picture of the scope of cocaine and heroin use in Ireland today", said Professor Brett Paull.